Before I had a child, I thought being a mom was going to be hard. The world told me it would be, and I believed the world. I can say with certainty that being a stay-at-home mom is much more difficult than any other job I’ve had in my life, and I know I’m not saying anything ground-breaking by admitting it. When your child is born with a disability, you become more than just their mom, you become their caretaker. When your child has Sensory Processing Disorder or other related neurological issues, it is very likely that you will become your child’s emotional regulator as well. My daughter had no ability whatsoever to regulate her emotions for the first two years of her life. I was the only one that could calm her down when she was upset. This meant that I always had to be “on.” Day or night, anything could tip her sensory scales into overload and she would fall into hysterics. Even the slightest break in my calm behavior was enough to send her into fits for hours. Just being a mom can easily take up 100% of your energy. So when you have to add in something else to the mix, like being their constant emotional regulator, it doesn’t really add up, does it? Like the classic airplane example of putting on your own oxygen mask before you help someone else, putting your needs first at times–instead of your child’s, can actually be the most unselfish thing you do. This post is actually centered around you–the caretaker–and understanding yourself better so you can help your child in the moment. No one, no one–is automatically prepared for handling sensory processing disorder 24/7, and there are going to be some really dark moments. While I can’t provide a magic fix so that you never have to watch your child (and yourself) suffer, I hope to help you keep the dark moments as just that–moments. If you can dig deep and find something calm to hold onto, you will be able to project a calm exterior (even when you’re panicked!) that your child can soak up like a sponge. If you’re thinking to yourself “Duh, of course I would like to stay calm, but I just can’t,” well–you’re both right and wrong. It is true that sometimes we will lose our cool because we are humans, but I believe that “calm” is like a muscle. Strengthening it is both an art and a science, and the more you practice, the better you’ll be at staying calm as your child’s emotional regulator. (Hint: the absolute worst time to start working on “calm” is in the middle of a meltdown!) There is a process, and I’ve outlined what has helped me below. This is listed first, because it is the first thing you NEED to do! The absolute turning point for me in dealing with SPD was finding another mom who had been through it. All my fears, perceived failures, and darkest thoughts that I never dared to speak were all some of the first things out of her mouth. Someone else understood. It wasn’t until I started talking to other people who had “been there, done that” that I started to realize that I wasn’t going crazy, I wasn’t failing as a mom, and this was all normal. It was ground-breaking for me and I wouldn’t want to go this journey alone. Find a local support group, a fellow mom-in-arms, an occupational therapist, a blog, or all the above. The more support you receive from others, the more confidence you will have in yourself. And no excuses, because I will happily respond to each and every one of you if you need to talk. That’s what the “Contact Me” header at the top is for! You read that right–YOUR triggers are what’s important, today! I’m sure you’ve spent countless hours pouring through books or consulting with therapists, and reading blogs trying to understand your child’s triggers and how to avoid them. Equally important is figuring out what triggers you. What is the one thing your child does that is just going to make you lose your cool? Maybe it’s the dreaded grocery store meltdown, when you feel stranger’s stares boring holes in the back of your head? Maybe it’s when you’ve spent half an hour cooking a meal in the exact way that your child likes, and they reject it anyway. Learn your triggers, and then, find your own calm-down strategies. Full disclosure–I felt pretty weird thinking about my triggers and “calm-down” strategies like I would for my daughter, but when you need to be the emotional regulator, it really helps! Identifying what is likely to make you lose your cool defuses some of the power it has over you. When you actually have a plan of attack and you practice that plan, it will be more instinctual when you are faced with a stressful situation. Okay, that sounded a little harsh, didn’t it? But I mean it literally! Since being your child’s emotional regulator at all times has the ability to make you feel, well, not very human-like, its important to have something relaxing to fall back on. I completely lost my own identity for months when I was caring for my daughter. Its easy to do as a mom, no matter what your child’s specific needs are. I guess the reason it was so easy to have my identity drift away on me was because she kept me so busy that I didn’t have any time to miss my hobbies. Sleeping and eating were the only things I was able to do for myself, and I didn’t get very much of either one of those things. I was in full-on survival mode, and I’m guessing that’s where you are, too. You might have to start small. For the first 6 months of my daughter’s life, my escape was taking a shower. Seriously. I would wait until my husband was home and could at least hold her, and I would shut the door and turn up the water (so I couldn’t hear her crying) and I may as well have been in my own little oasis. If all you can give yourself now is a shower, then do it. Read a book for 20 minutes after your child is in bed. Make it your time to relax. Hopefully, eventually, you will be able to actually get away for a while and do something you really love. Which leads us to number 4….. This step is the most important one for truly regaining your sanity as an emotional regulator and strengthening your “calm” muscle. I hope you are lucky enough to be around family and friends that can step in from time to time and watch your child while you leave the house for a bit. My mom would watch my daughter for a couple of hours once a week while I went swimming, and that break just really set the whole tone for the next few days. Luckily, since my mom related to my daughter in much the same way I did, it wasn’t much of an issue to leave her. If family baby sitters aren’t always available, consider using the daycare at your local gym. This was a huge battle to get my child accustomed to daycare, but I’m so glad I stuck it out. They often had to come get me because she was crying and it even got close to the point of them saying they couldn’t “handle” her anymore. But I kept pressing on and trying everything to help her enjoy her time there, and after 18 months, it finally paid off. She now enjoys going and gets to practice interacting with other children. Yes, it can be a bit of a HUGE headache to get a sensory-sensitive child comfortable in a new environment, but that’s how important that hour is. It’s worth fighting for! I truly believe that exercising works on so many levels because it helps to calm us down. If the stress of being an emotional regulator fires you up and makes you fidgety (like me!) then do a high intensity class that will wear you out and make you too tired to worry! If the stress makes you want to retreat and shut down, try something like yoga, or take the dog for a walk. I know this list of ideas can seem a bit daunting or even impossible at first, so don’t feel like you have to accomplish them all right away. Even just changing your thoughts to what you can do for yourself is a big leap for most of us–I get it! 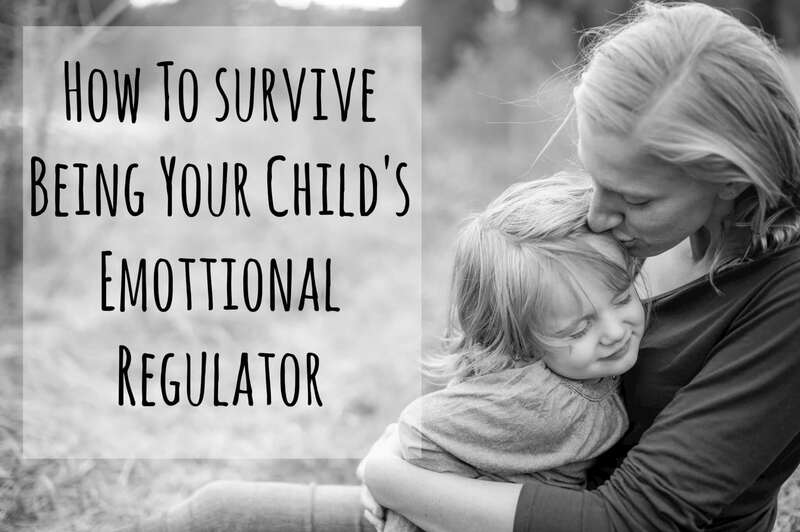 We’re so used to trying to help our children develop regulation, we never stop to think that we need to strengthen our own emotional regulator skills. You don’t have to implement all of these suggestions by tomorrow, but can you promise me that you will try at least one of them today? !